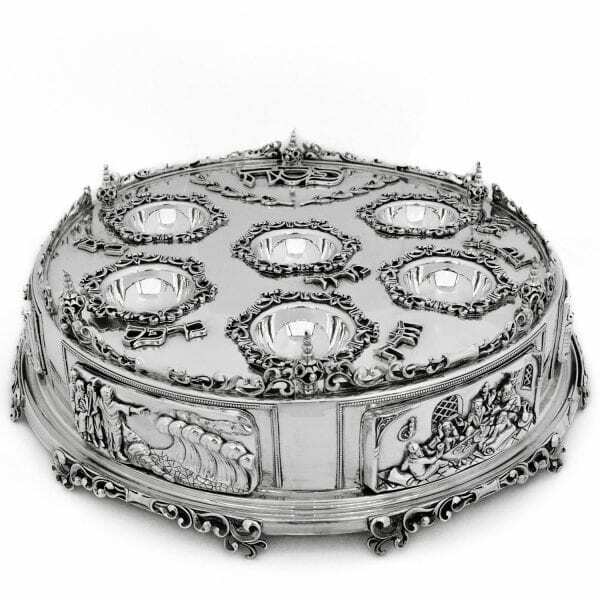 Passover is coming right up, and we’re here to make sure you have a holiday filled with the finest Judaica and top pieces. In order to really enjoy the holiday, enhance it with Judaica you love! There’s nothing like getting to the Seder and looking upon your table with joy and pride. The Seder plate is the pinnacle of the Passover table. We know this, and we want to make sure that your Seder table is the apple of your eye. 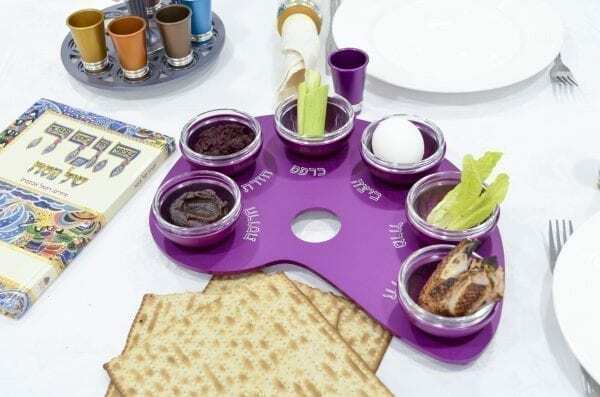 We’ve got Seder plates in every style, color, and even shape, so that it’s easy to pick the Seder plate which best suits you, your personality, and of course, your Passover table. 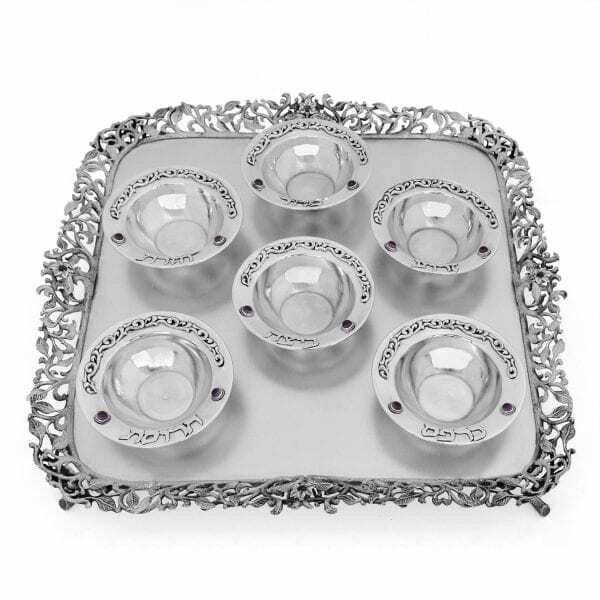 A totally modern design which still embraces the traditional, this Seder plate effortlessly blends sterling silver and anodized aluminum to create a masterpiece which will light up any Passover table. All the bowls are removable, and each name of the traditional Jewish foods is elegantly cut-out on the plate. Take your Seder plates to new heights! A sterling silver plate sits atop three aluminum plates, perfect for the three matzot for the Seder (but also, just because they look stunning.) The aluminum shines through the cut-out Hebrew lettering, and the shine of the silver blends perfectly with the matte aluminum. This Seder plate is for the adventurous. This brand new plate is shaped like a paint palette, with bowls placed like paint colors. It’s modern, clean, and totally unique. This one’s monochrome, available in any choice of color, from glittering gold to rich, deep purple. 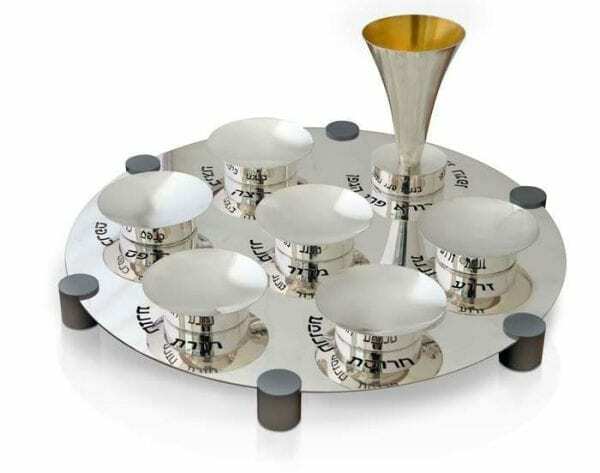 It’s also available with a Kiddush cup here! For those who love the rainbow, this paint palette Seder plate features a silver/grey palette with an array of colorful “paint” bowls. Pretty as a picture, perfect for Passover (we love alliteration). Here it is without a cup if that’s what you prefer. For something in-between, we’ve got the two-colored paint palette plate. 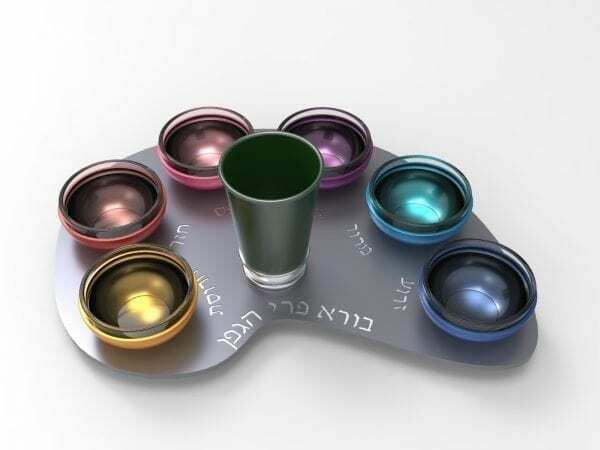 Pick one color for the base and another for the bowls and Kiddush cup. Your creation will be unique to you and perfect to showcase at your Seder. 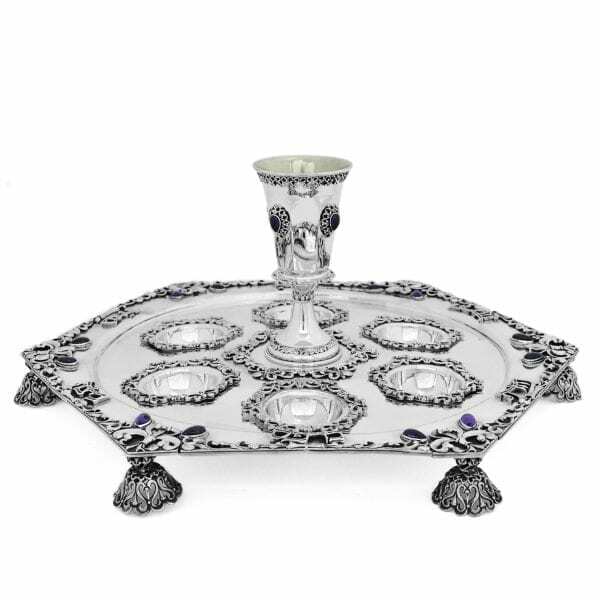 Because round is boring, we’ve got a hexagonal, pointed silver Seder plate, bedecked with semi-precious amethyst stones and stunning silver decorations. 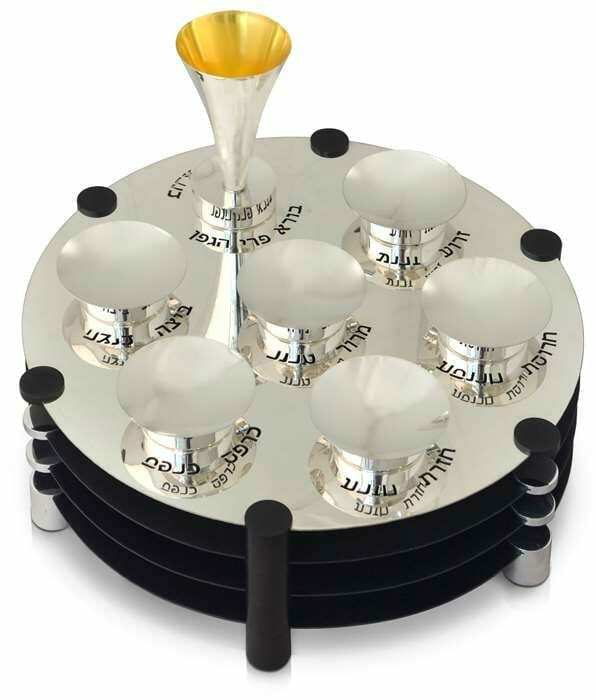 It’s a pretty special piece, but we’ll happily share it with you to light up your Passover table. A silver Seder plate with a totally unique rim, created out of cut-out floral designs, giving this a nature-inspired look. The square plate with rounded bowls create a beautiful contrast to this glorious piece. Experience the rich re-telling of the story of Passover through stunning hand-carved illustrations and intricate detailing on this one-of-a-kind Seder plate. This limited edition piece will enrich your holiday experience, bringing the Passover story to life. It’s the piece de resistance of all the Seder plates, and it’s waiting for you. Happy Seder Plates, Happy Passover! 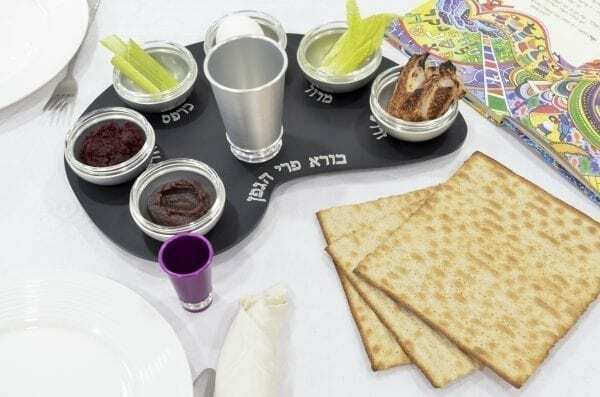 We’ve also got a range of Passover gifts for hosts, friends, and loved ones. Check it out here for holiday gift ideas that you don’t have to wrack your brains for (we’ve done the hard part for you). So between our gifts and Seder plates, we hope to have you sorted for Passover. Shop away and make your Passover perfect and extra special. Happy Passover, from ours to yours!